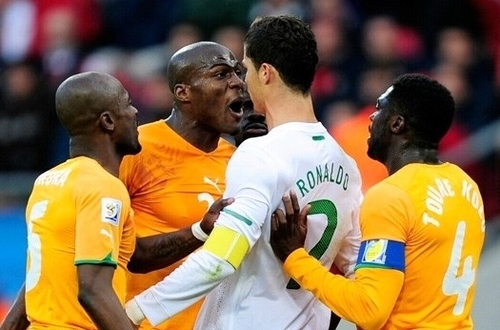 Ivory Coast shouting at Cristiano Ronaldo. . Wallpaper and background images in the FIFA World Cup South Africa 2010 club tagged: south africa 2010 fifa world cup world cup cristiano ronaldo ivory coast. I will never forgive my boss for calling me in to work today. I missed this match! I wanna see Ronaldo getting yelled at!!! !